The EF-45 next generation dual iris imaging system provides unprecedented subject ease of use through a highly innovative and intuitive user positioning approach. Subjects will view their own face in a front-facing, high resolution 5.0 inch color display to position themselves correctly within the real-time graphic interface. They will intuitively and naturally move to the correct position by simply centering and sizing their face image to the box within the display. In addition, the positioning box and the top border turn green to indicate proper distance positioning, after which the iris biometrics images are automatically collected, provided that the real time image quality metrics are satisfied. 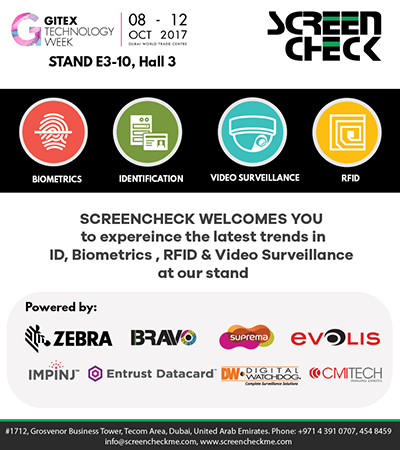 Horizon Informatics Trading is the branch of ScreenCheck Middle East who is the Distributor of World’s leading brands in card printers, biometric readers, Access Control equipments, RFID readers, CCTV cameras etc. In Saudi Arabia we distribute Zebra, Suprema, Impinj, Bravo, Tiso. Edikio etc which are the market leaders in their domain. © Copyright 2019 – ScreenCheck Saudi Arabia . All rights reserved. Safe School provides Indoor Positioning System based on BlueTooth and WiFi which helps the school to monitor the attendance in the classes, which students wait most for bus or pickup, how punctual teachers are reaching in classrooms, are all the classrooms checked post-school by security staff or not. It empowers the student with “World’s First iCard with Panic Button for Schools”. Just on the press of button, the school security team is alerted with the precise location of the child within the school along with details. RFID based Emergency Evacuation or Mustering solution provides visibility to track the location of the employees during an emergency. It helps the first responders to act efficiently and to reduce the response time. It can be implemented in all the sectors and industries. The employee wears the RFID badge or wristband which will be tracked at various checkpoints in the building using the RFID Readers. The reader at the assembly point provide the details of the people assembled and the people missed. The current location of the missed people will be alerted by the system and focused rescue actions can be performed. Many manufacturing and Oil & Gas facilities focus on condition monitoring or predictive maintenance solutions for motors, bearings, rollers, conveyors, water pumps, etc.. An unplanned motor failure can cause a line-down situation ranging anywhere from a couple of hours to several days. BLE based condition monitoring solution is one which predicts failure or presents the deterioration rate for any equipment that has the potential to cause downtime, in time to react. Bluvision’s advanced Condition Monitoring uses machine learning and Artificial Intelligence (A.I.) to predict failure on any motor or mechanical equipment, weeks or months before the failure happens. Trackable GPS padlock is a one-stop solution for securing, monitoring and tracking containers. Padlock provides constant location and 24/7 online access to the status of your containers protected by our service. It is an independent IoT device which is able to access the internet on its own and have an accurate location on any part of the globe. Any tampering such as burning, smashing, cutting or signal jamming of the lock are reported as an alarm, with time and location of the event. The lock has an internal battery which can be charged wirelessly with a charging pad. Our Professional Display Solutions includes video walls, interactive kiosks, LED displays and Display Management Software products. We provide Professional Display Solutions across industries such as retail, hospitality, F&B and automotive to serve their various marketing and advertising needs. We provide turnkey solutions in Digital Video Wall, Seamless LED Screen, Interactive Kiosks etc. We offer comprehensive network solutions for your organization by covering all the networking areas including Switching , Firewalls , Servers, Storage and Structured Cabling. Network efficiency & availability gains are the key for business efficiency and we help our clients in maximizing the value of current Data networking infrastructure by identifying risks and opportunities, analyzing network approaches and recommending network services to optimize their network. Our services include Structured Cabling, Wireless Networking and Switching. V-Authenticate (VAMS), our visitor management solution allows you to monitor and control the visitors in office premises. The software keeps the logs of all visitors entering the premise. Their details are enrolled either by entering the data in the software or scanning their IDs. Meetings can be booked by the host along with the meeting room. The system can read most of the National ID documents in GCC countries for the visitor registration. System is already integrated with many access control systems. We provide comprehensive video surveillance solution that helps you monitor and improve productivity and also secure your premises by monitoring visitors. Our partnership with the major international camera and accessory manufacturers help us provide the most advanced and competitive solutions to our customers. Our installation & maintenance division has a strong foundation of engineers and technicians, ensuring the best service to our clients. Regular factory training by our suppliers & partners ensures that our engineers are always updated on the latest technologies and equipment. TimeCheck is a powerful time and attendance management solution compatible with various input devices that use fingerprints, facial recognition, proximity cards, PIN technology etc. TimeCheck eliminates all manual inputs to calculate attendance, overtime and salary. The ease to integrate with any third party ERP, HRMS and Payroll software makes TimeCheck the leading attendance management software in the market. Card Issuance ID card is the most simple tool today for identification. Whether it is a Driving License, Employee or Student ID, Customer Loyalty Card, Banking Card; our solution helps the customer to manage card issuance in the most efficient manner. Our system manages all the processes in card management, from capturing the data, photo and biometric information, approving/rejecting the issuance, card printing, quality control and delivery. The well defined processes in the system keep a complete audit trail and is available for any verification. The system supports most of the identification technologies like Mifare, RFID, UHF, HID, contact smart card, proximity etc. Our encoding plugins for these technologies make the printing and encoding in a single pass which eliminates human error.